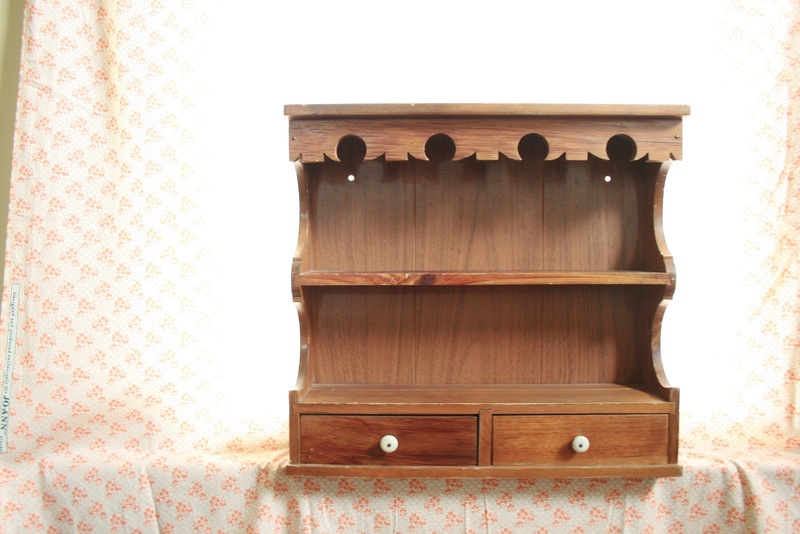 I bought this knick-knack shelf at the thrift store about a month ago, with the intention to give it a make-over. Today, I finally did. I come across shelving like this all the time at the thrift store, but they're usually pretty beat up. This one was no exception, haha. With some craft paint & some contact paper, I covered up all the rough bits and prettied it up a bit. I'm actually quite pleased with how it turned out. I like using the sponge brush, 'cause you can dab the paint on and avoid those dreaded streaks and lines of paint that you tend to get with a paintbrush (time consuming, but worth it if you despise paint streaks like I do!). You can remove that chipboard panel on the back by prying the nails out with the back end of a hammer. Then, apply your favorite contact paper, and nail it back on! 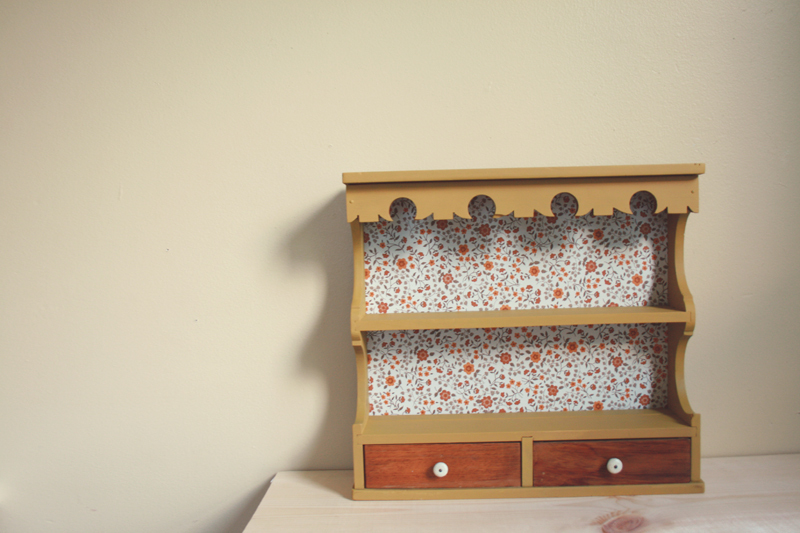 Hooray for adding more kitschy cuteness to my work-space. I think I'll use it to display my finished brooches, maybe. 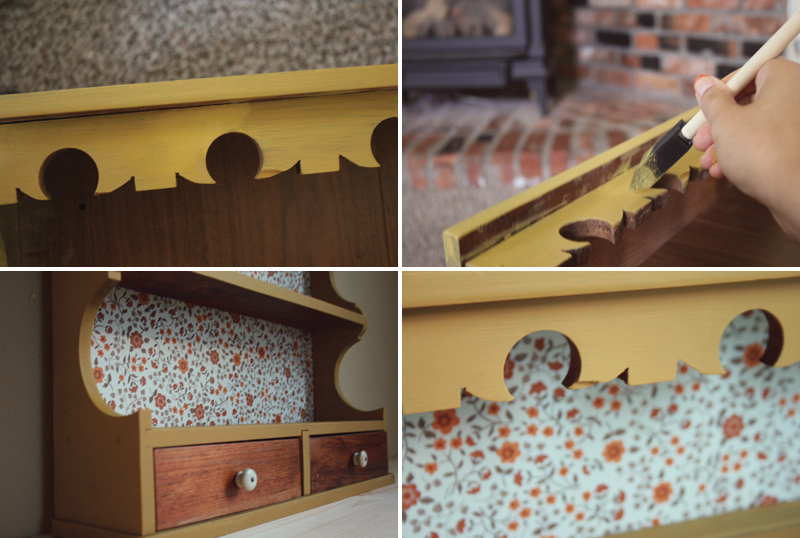 I left the drawers the way they were 'cause the wood-grain really pulled it all together. Anyway! I'm excited to do this to more things, heehee. 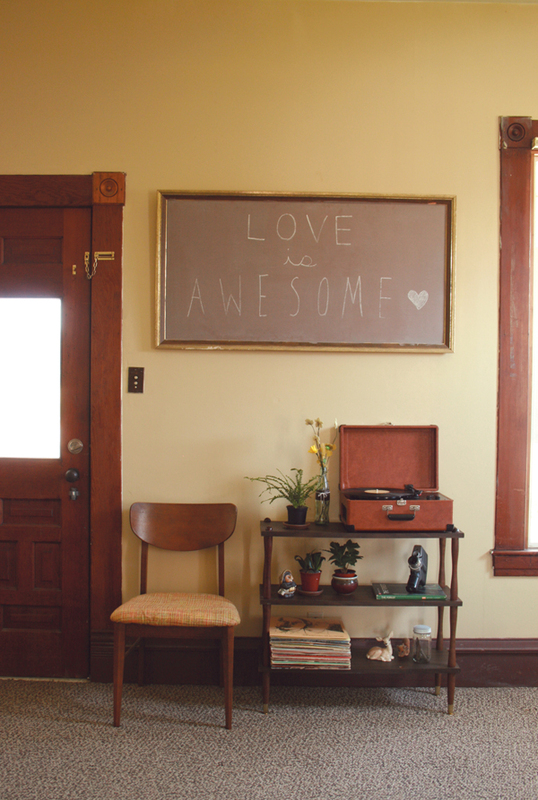 1. one of my favorite parts of the house - a nice little spot for listening to records, underneath the "love is awesome" chalkboard we made for our wedding. Plants love records and records love plants. On the bottom shelf is a jar with dirt and twigs that Franklin sent me when we were writing letters. A little piece of Washington that I've carried with me since! 2. 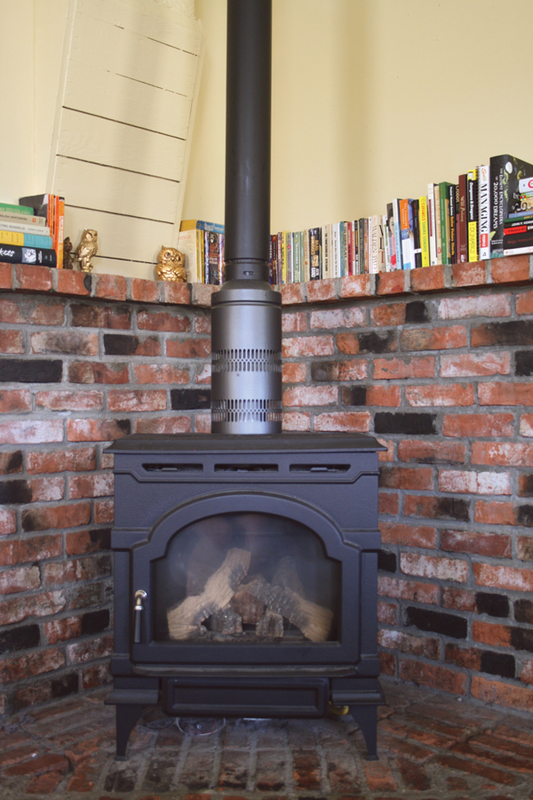 Our little fireplace nook turned bookshelf. I spy lots of sci-fi. And, yes, that is a copy of Dungeons & Dragons for Dummies. 3. 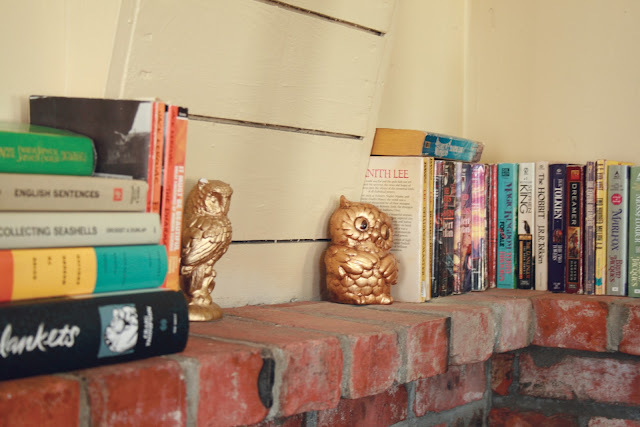 My golden owl collection, keeping a close eye on the books. We're still working on my craft room. It's a complete and utter catastrophe at the moment, but I'll post up some pictures once things are in working order. It's pretty sad how we're so easily able to fill a 4 bedroom farm-house with all of the stuff we managed to cram into our super tiny one-bedroom apartment. I think it's about that time we watch a few episodes of hoarders to scare ourselves into a purging frenzy. I say this, of course, right before we head out the door to hit up some thrift stores, haha. Anyway! Now that we're done with moving, I suppose we haven't really got an excuse to neglect this blog like we have been. Thanks for sticking around!